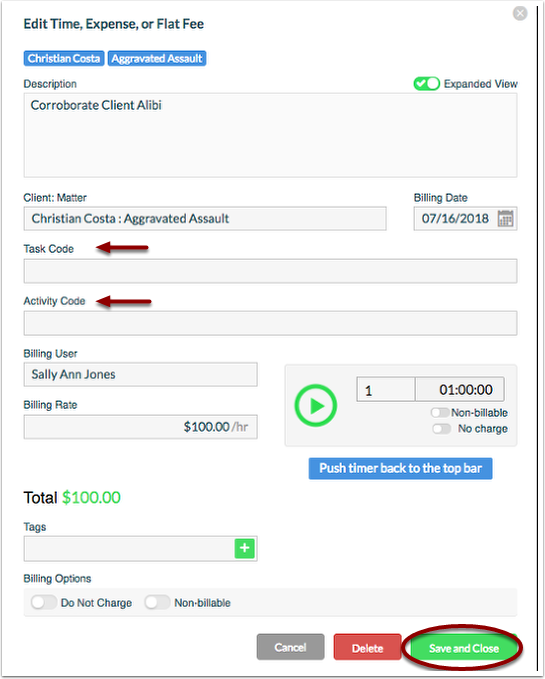 Rocket Matter Knowledge Base Insurance Defense Package - LEDES Billing- NEW!How to audit LEDES billing. Note: In order to 'Enter Audit Mode' while batch billing, you MUST have LEDES enabled. To enable LEDES, contact Rocket Matter Support for additional assistance. 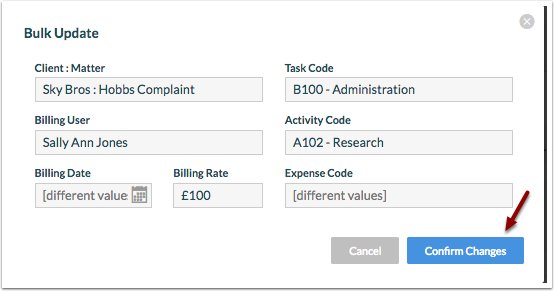 Also, 'Audit Mode' is only available while batch billing. 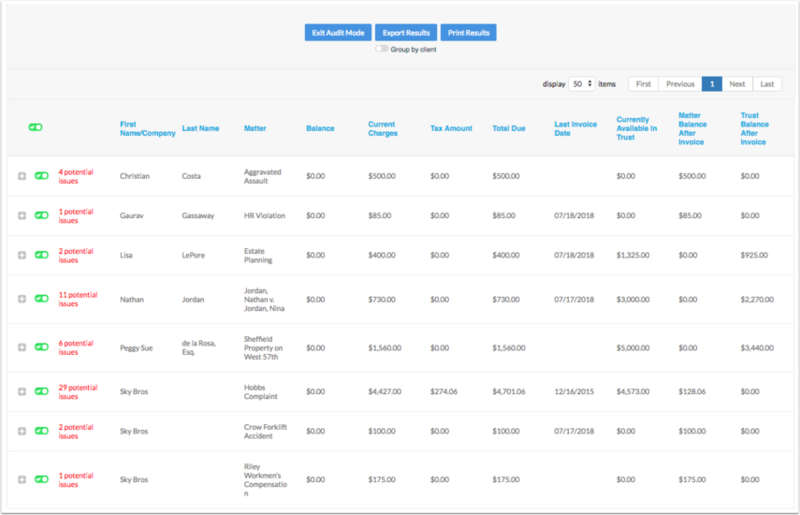 From the Batch billing page, apply your desired filters and select 'Get answer'. Note: If there are no errors found while auditing, no results will populate. Click on the + sign to expand potential issues. 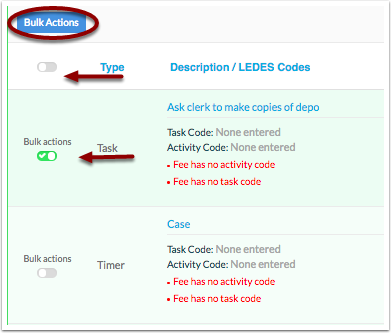 Audit in bulk by choosing the appropriate 'bulk actions' toggle. 1. Select all lines or select specific lines. 2. 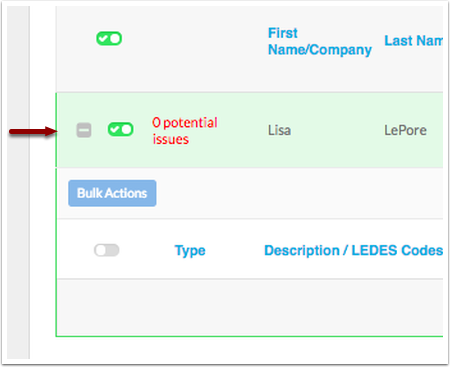 Click on the blue 'Bulk Actions' tab to apply your selection. Update your billing information and 'Confirm Changes'. Once you have corrected all potential issues, collapse this screen by selecting the ( - ) symbol on the left hand side. Audit without utilizing the bulk feature by clicking on the 'Description/LEDES Codes'. Enter the correct Task & Activity codes then 'Save and Close'. Once there are no remaining errors, you can 'Exit Audit Mode'. Prev: How to run bills for LEDES only. Next: How to insert LEDES information to my invoice template.